With the end of winter comes the emergence of many animals who have been sleeping away the cold, dreary months in anticipation of better weather. Snakes are one of those animals, but unlike most who leave the public eye in the winter, snakes practice winter brumation instead of hibernation. of sleep as well. The two processes may be slightly different, but they produce the same end result: conservation of energy to survive the brutal winter months. Snakes typically undergo winter brumation from October or November to March or April, making now the perfect time for the creatures to re-emerge. Snakes have to enter their sleepy state not only due to the cold temperatures but also because none of their prey ventures outside much in the winter months either. 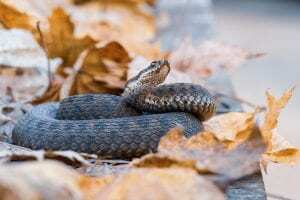 Generally, snakes survive mostly on insects, rodents, birds, fish, frogs, lizards and other small mammals, but it depends from species to species, especially among the most common snake species in Maryland. As snakes venture out to find food for the first time in months, their travels may lead them onto one’s property, especially if certain factors are present. To avoid snakes, one good rule is to feed pets inside, since snakes are attracted to pet food and will come onto your property if the food is accessible. Doing so could pose a safety risk for one’s pets, which are far more likely to be bit by a snake than a human. Additionally, it may be a good idea to seal all holes in any bird feeders and make sure bird seed doesn’t fall to the ground. While the snakes aren’t attracted to the bird seed itself, any homeowner will know that birds, squirrels and rodents are all attracted to the bird seed, and all three animals are an ideal dinner for a snake. While early spring temperatures are not that warm, by the time summer comes around, homeowners should trim tree branches, bushes and any shrubs which provide ample shade. Snakes need to regulate their internal body temperature by staying in the shade those plants provide and will be happy to camp in your yard if you provide such accommodations. If you think you have a snake problem on your property, call the experts at Shumaker Animal Control to deal with the problem for you. Our experienced team will take care of the problem in a timely manner, ensuring that you, your home and pets are not in any danger. This entry was posted on Wednesday, March 27th, 2019	at 4:03 pm	. You can follow any responses to this entry through the RSS 2.0	feed. Both comments and pings are currently closed.